Part student hang out, part long-standing local favourite, this live music venue effortlessly blends old-school pints and traditional Sunday roasts with the up and coming artists of the modern comedy and music scene. From the same people behind The Lock Tavern in Camden and Adventures In The Beetroot Field events. 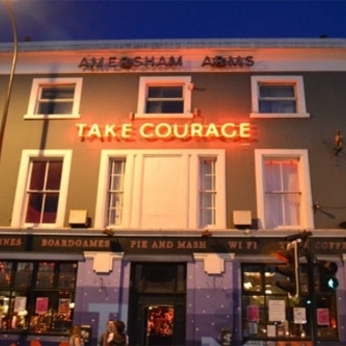 Time Out has described it as a "bionic superpub": a 300 live capacity out the back, fully equipped for bands and DJs; at the front, a proper, traditional pub with food being served all day; upstairs, the Take Courage, an individually curated art gallery space. A traditional pub at the front. Good food and drink, great music, and even better people. Your new local. Out the back, a 300 capacity live music venue. From new bands, big names, the best DJs and promoters around, comedy, local heroes, music from all over the place (both literally and metaphorically).